It was a lovely day this Sunday, so we went to Coney Island. 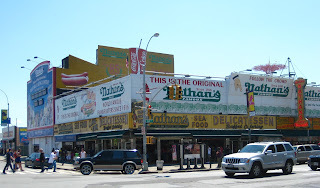 Erik had his first Orginal Nathan's Frankfurter and is convinced he can take home the coveted Mustard Belt. Nothing says summer like fried clams, boardwalks and the beach. Close but no...wait, not close at all. Mike Birbiglia on Bleecker St.
"Someone" thinks this is a sign . . .